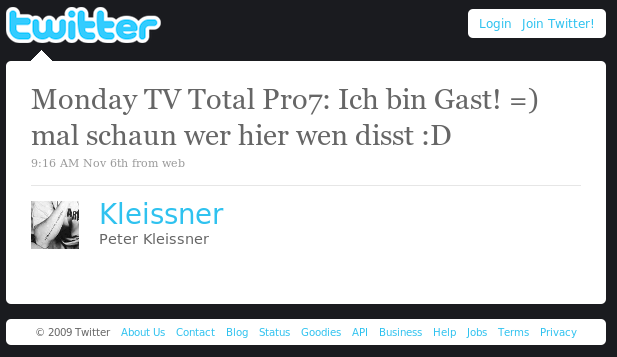 Even I had to double check when I saw Peter Kleissner (from Stoned Bootkit fame) talking about appearing on TV Total in Austria. It’s not often that Security Researchers get TV time over here in Austria, and I’m sad to say, I doubt this interview is going to help that situation much. I’ve met Peter a couple of times now, as I’ve seen him present over in Las Vegas, as well as at HAR2009 in the Netherlands. He also did a presentation of the Stoned Bootkit at one of the CERT.AT meetings in Vienna. I didn’t really talk that much with him at these events, but he seemed an ok guy. A little young and idealistic, but that’s not a bad things most of the time. I didn’t manage to catch the segment live, although a couple of colleagues watched. The reviews they gave were not particularly shining. So after getting back from work today I decided to take a few minutes to search YouTube for a link and see what was discussed. There’s a lot I could say about the interview, but I wont. Right now there isn’t an English translation, and I’ve not really got the time to make one. I’d much rather leave people to form their own opinions before I give mine. For those interested here is the YouTube version of the TV Total interview (6:28) in the original German. If anybody out there wants to do a German/English translation, please let me know. It might be a while before I can get round to writing one up.